Before heading to Musexpo and speaking at the Worldwide Radio Summit last week, I spent some time in downtown Los Angeles to explore a part of the city that too often gets overlooked. My renewed interest in downtown Los Angeles was sparked by Far East Movement's "Free Wired," the group's debut record that was inspired by the group's downtown upbringing and friendship. At times gritty, often breathtaking and always colorful, downtown Los Angeles stretches from Koreatown in the northwest to the concrete banks of the L.A. river in the east. The area lost some of its luster in past decades after its heyday in the 1920s, but in recent years it has gone through an urban renaissance with young hipsters, culture hustlers and other urban adventurers moving into the large loft spaces that can be found all over downtown. The arrival of new museums, galleries, clubs and bars has helped accelerate downtown's resurgence, making it a perfect breeding ground for everything hot and happening. It's exactly that colorful urban spirit that Far East Movement's "Free Wired" taps into. The group's all-inclusive, free wired mashing of styles to create an edgy, yet mainstream-friendly aesthetic was inspired by their downtown upbringing and is now reflected in their music, look and artistic attitude. For my stay in downtown Los Angeles, I stayed at the Hilton Checkers, an excellent boutique style hotel right in the middle of downtown that I highly recommend if you are looking for comfortable and friendly lodging. Stroll up the street from the Hilton to check out the magnificent LA Philharmonic's Walt Disney Concert Hall that was designed by architect Frank Gehry. I zigzagged through the quiet streets of Chinatown to the Moorish splendor of Union Station that is filled with transients from all over the country. From there, I walked down Alameda Street towards the vibrant Little Tokyo district on downtown's eastside. 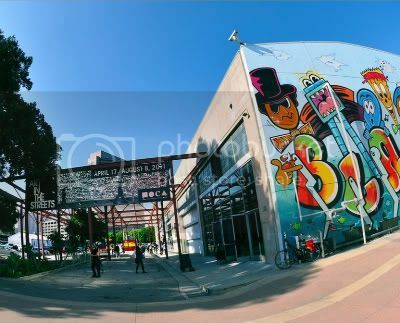 An absolute must for pop culture fanatics is Little Tokyo's Geffen Contemporary at MOCA, a large modern art space that is currently hosting an exhibit about Arts In The Streets. Yes, even Geffen is feeling "free wired." Far East Movement got wind of my downtown explorations and tweeted me some of their favorite hang outs, including Taco House 1, an authentic Mexican taco stand that serves a large menu of tasty tacos and burritos. Right next door is La Cita where Far East Movement shot the video of "If Was You (OMG)." I can best describe the look of the bar as a folky Mex mix with a cool kitchy, disco twist. Amazing scene of people. If you're ever visiting Los Angeles, I highly recommend you take some time to explore downtown Los Angeles. Discover downtown's bleeding edge and cultural innovations that I find frankly a whole lot more exciting than the city's regular tourist destinations. Get a head start by watching "Rocketeer (LA Dreamer)," a short film Far East Movement produced as an ode to their hometown. A big thank you to Hilton Hotels for their hospitality and a jumpin' high-five to the guys of Far East Movement for pointing out some of the sites and giving me that "Free Wired" feeling. Check out this special promo video I recorded for MTV in anticipation of the MTV O Music Awards, which airs this upcoming Thursday at 11 PM EDT live from Las Vegas. ArjanWrites.com is nominated for an MTV O Music Award in the Best Independent Music Blog category. In this MTV promo, I talk about Robyn who is nominated for an MTV O Music Award in the Most Innovative Video Category and more than deserves to win. Click play to find out why I think Robyn should be a winner. Today at 4 PM EDT, MTV will be live streaming a panel with producer Jermaine Dupri, legendary music video director Wayne Isham, and music journalists Caryn Ganz (Yahoo Music) and Brenna Ehrlich (Mashable) where they will debate the MTV O Music Award nominees for the most innovative music video. Make sure to tune in. More news about the MTV O Music Awards in the next few days. I'm thrilled to introduce some brand-new episodes of Cherrytree Pop Chop Minute with Arjan Writes that will air this week. Cherrytree Pop Chop Minute is a unique web show that I host and is produced in close partnership with Cherrytree Records. Each episode is no longer than 1 minute, which makes it perfect to share on Twitter, Facebook, or to watch on your mobile phone. This week, we will be airing new shows every day at 12 noon PDT, Monday thru Friday. The Cherrytree Records team and I have filmed a bunch of new episodes earlier this month at South by Southwest in Austin, and we will be making all of those available during the next few weeks. One of the new songs he performed is his forthcoming new single "Do It In The A.M." that is also the title track from his new album that drops later this year. Frequent readers of ArjanWrites.com know that I have been been following Frankmusik for years and the singer has kindly kept me in the loop on his recording process to keep me posted throughout his journey. It was fantastic to see him rock it out on stage - bigger and bolder than ever before. Exciting news! If you're an iPhone or iPad user, you can now keep up with all the lastest greatest on ArjanWrites.com with the brand-new, official ArjanWrites.com iPhone and iPad app. 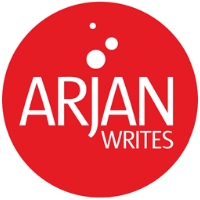 Read the lastest blog posts, stream guilt-free MP3 downloads, watch Arjan's candid video interviews and connect with Arjan on Twitter and Facebook right from your phone. Head to the iTunes App Store to download the ArjanWrites.com ad-free iPhone App now. Totally free! Available in iTunes stores worldwide.